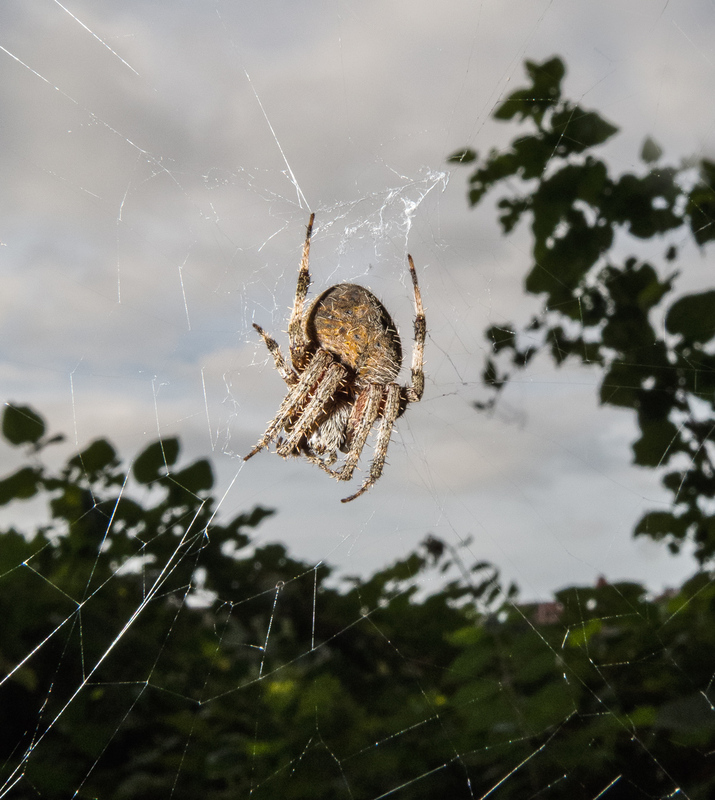 On Monday at Occoquan Bay National Wildlife Refuge I watched with fascination as this spider (maybe a Marbled Orbweaver (Araneus marmoreus) spider) worked on her web. She seemed to have started with the spokes coming out of the middle and was adding the ribs when I photographed her. 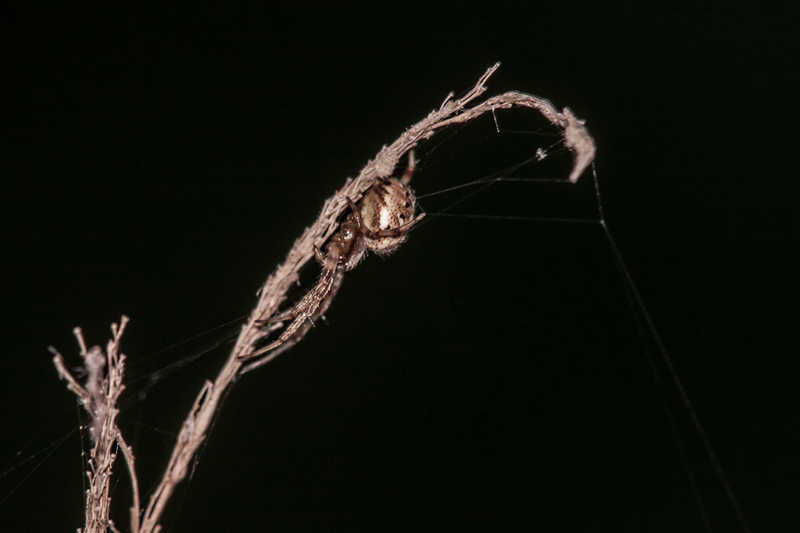 If you look closely in the first image, you can actually see the web material coming out of one of her spinnerets, the organs in which a spider produces the different kinds of silk that make up a web. I tried to figure our her process as I observed her. It looks like she would produce a length of silk, maneuver it into place on one of the spokes with one or more of her legs, affix it in place, and then start the process over again. For the final image, I moved back a little to give you a somewhat better view of more of the web and a sense of its shape. I have photographed spiderwebs many times before, but this was the first time that I watched one being built. 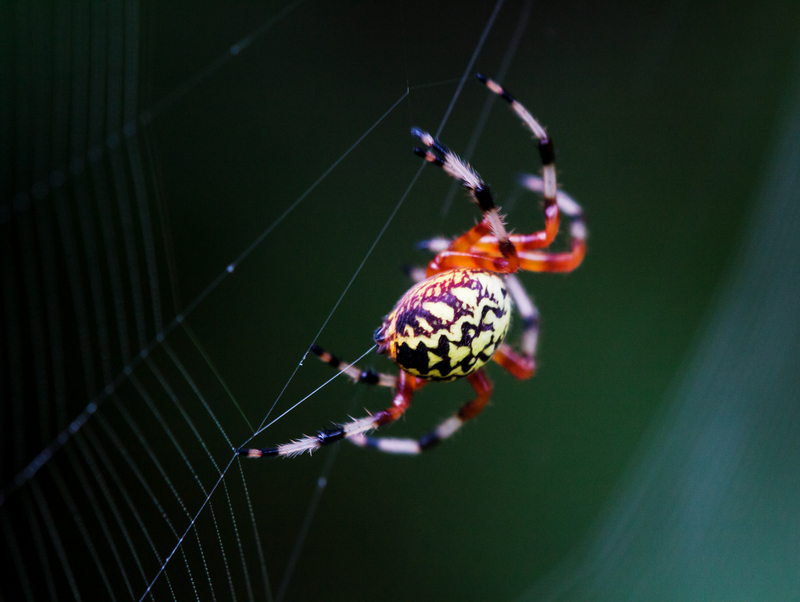 My admiration for the skills and artistry of spiders continues to grow—they are simply amazing. Dragonflies seem to love to perch on this piece of rusted rebar that sticks out of the water at Jackson Miles Abbott Wetland Refuge. I really like the juxtaposition of the man-made and natural elements in this shot of a male Eastern Amberwing dragonfly (Perithemis tenera) that I spotted on Monday. 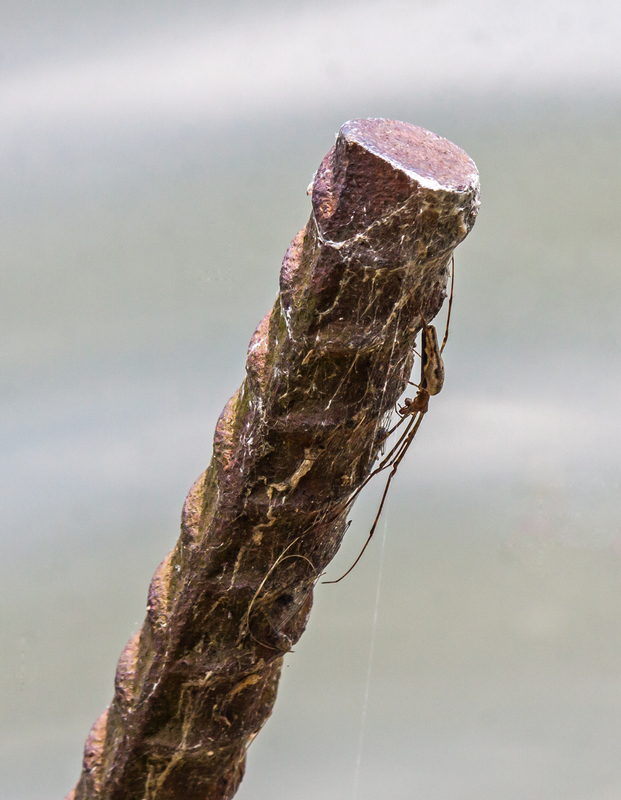 You can’t see it really well in the first shot, but there is a spider on the rebar in addition to the dragonfly. I got a better shot of the spider later in the day. 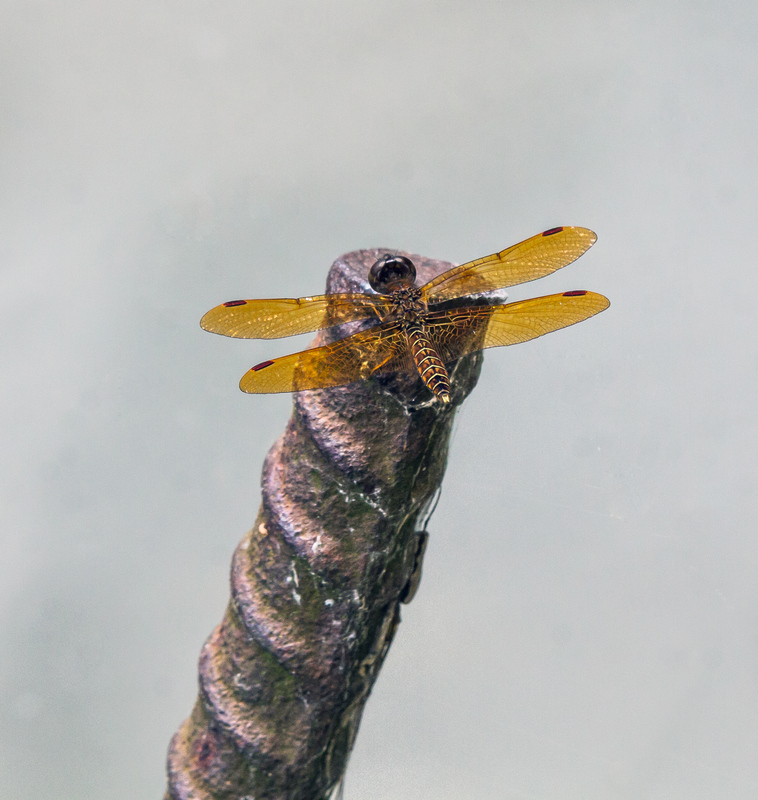 I don’t know for sure that it could capture the dragonfly, but it’s a potentially dangerous situation for the dragonfly (and I have photographed several dragonflies that had fallen prey to spiders in the past). I know that some folks find spiders to be creepy, but I think they are beautiful, particularly when presented creatively in an image. 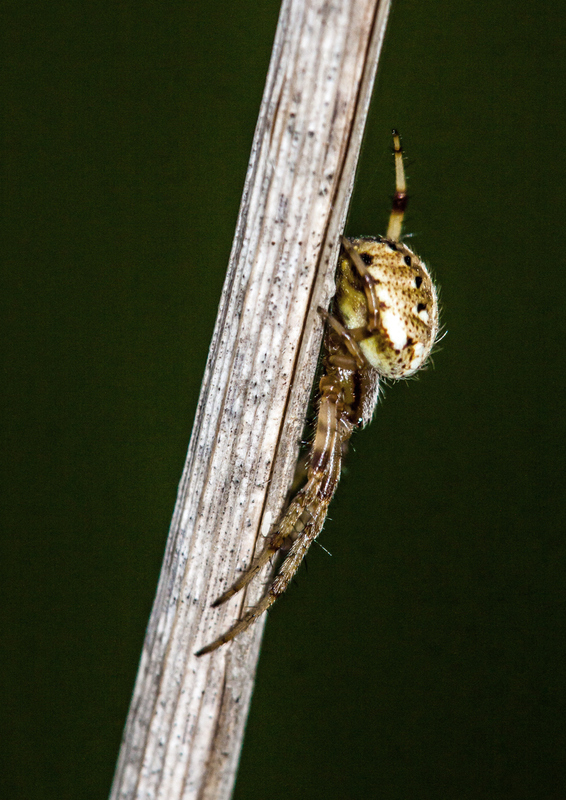 I spotted this little spider earlier this week in a wooded area at Huntley Meadows Park. The area in which the spider was located was pretty dark, so I decided to use the pop-up flash on my camera. The light was a bit too powerful at such close range, so I improvised a diffuser by slipping a plastic sleeve over the flash—when it is raining out, my Washington Post is delivered in plastic sleeves. All three of these shots were taken using the flash, but they look so different because of the direction of the ambient light. In the one that has a light background,for example, I was shooting almost directly into the light, so the flash was need to avoid getting nothing but a silhouette. This spooky spider image that I took late Friday afternoon while hiking along part the Potomac Heritage Trail is probably more suitable for later in the month, but I just couldn’t wait until Halloween to share it. Normally when I use fill flash I try to be subtle, attempting to add a little pop without making it obvious that I used flash. In this case, you can’t help but notice my use of the popup flash. Normally I would take a shot of a spider like this with my macro lens, but I was travelling light with just my superzoom Canon SX50. The 50x zoom of this camera has helped to bring distant subjects closer, but I had never tried to use the camera’s macro mode. I quickly learned that you have to be really close to your subject, literally only a few inches away. I was pretty happy when I was able to get the second shot below, but wanted to add to the drama of the shot. I dropped the exposure compensation in the camera down to a minus three stops and got my favorite shot. 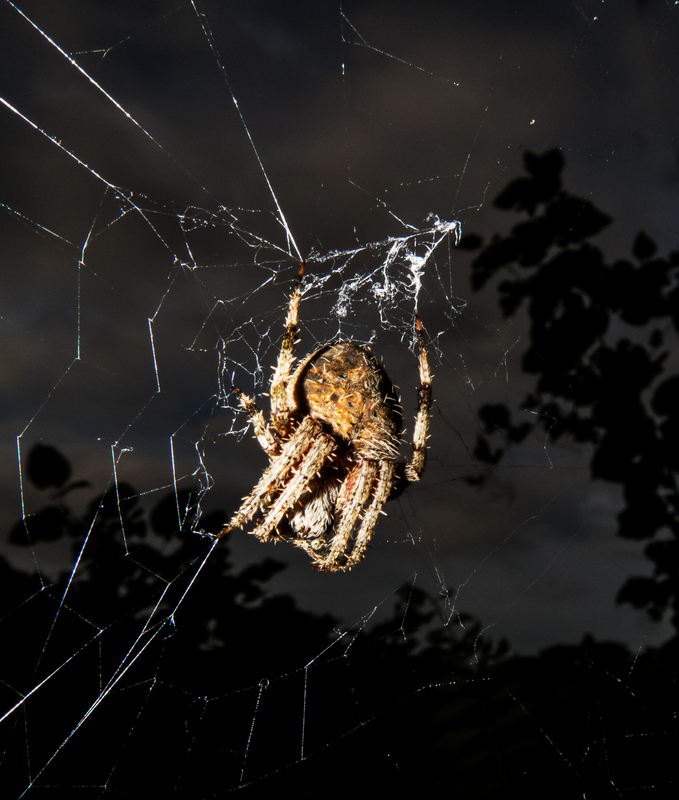 The darkened sky and the way that the flash illuminates the spider give the image a kind of creepy look that feels appropriate for a spider that was just about at eye level. After a summer of not seeing many spiders, I was thrilled recently to spot this orbweaver spider as it dealt with an unidentified prey that it had captured. 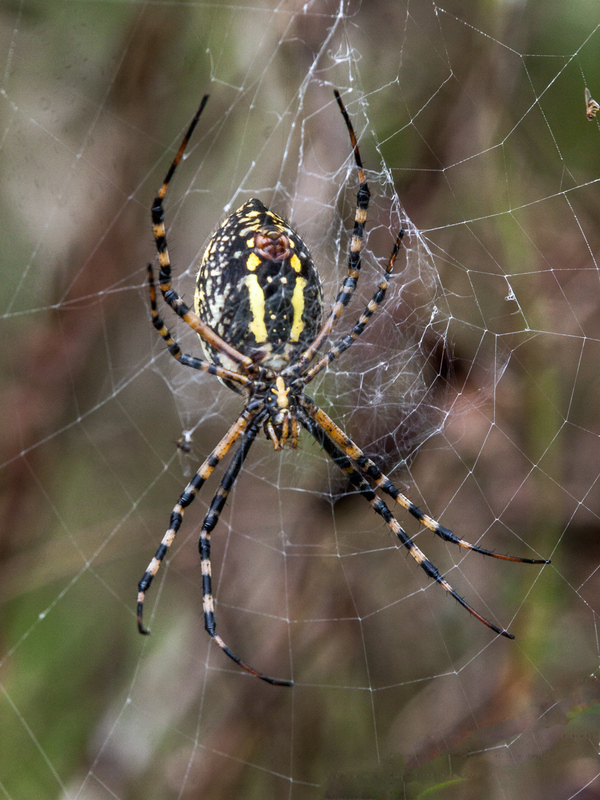 Most of the large spiders that I observe are Black and Yellow Garden spiders (Argiope aurantia), but this one looks different from the ones that I have previously seen, especially in the first image. 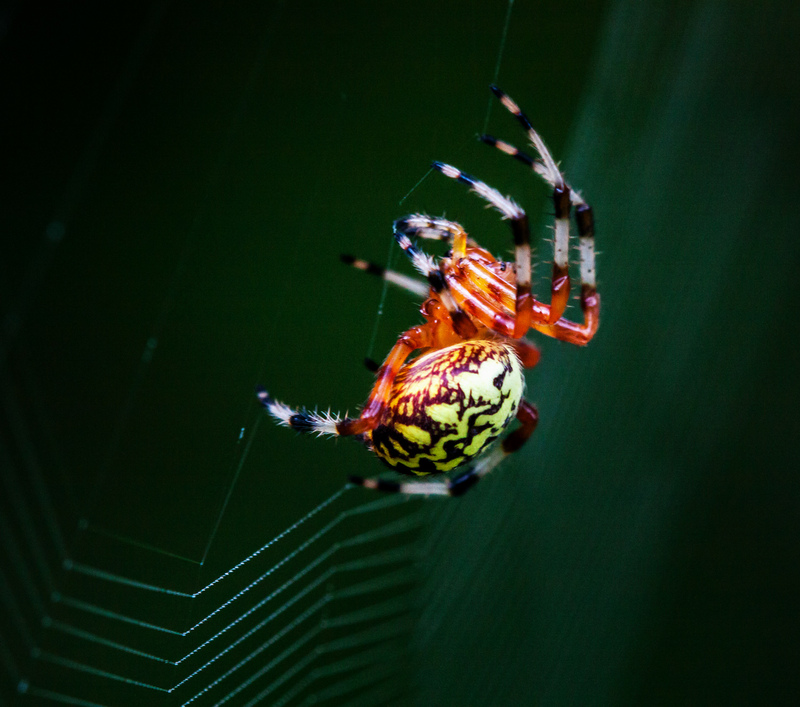 It may be that I am used to seeing the spider only in the center of her web, as in the second image, or perhaps this is a different spider species. 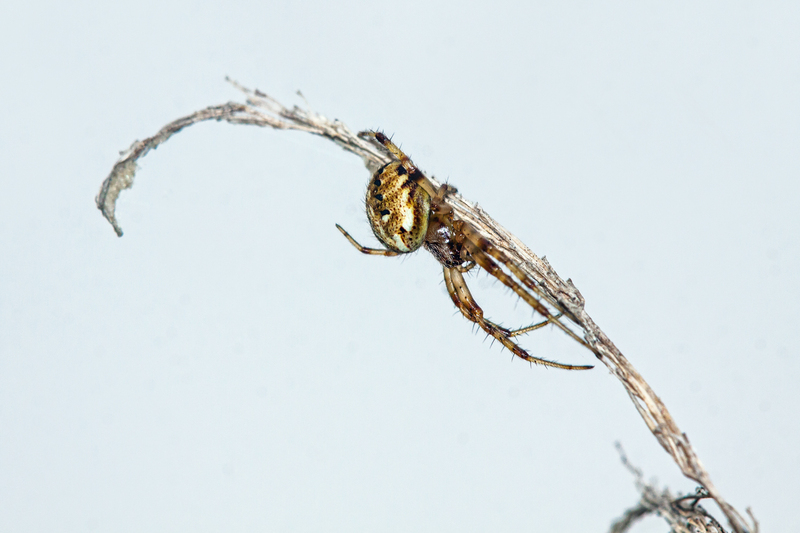 This was an unusual case for me, because I spotted the spider as I was walking through a field of waist-high vegetation and I was able to get pretty close to the spider and get these shot with my macro lens. Generally, I am forced to photograph spiders like this from a distance (which most people probably think is a good idea anyways). 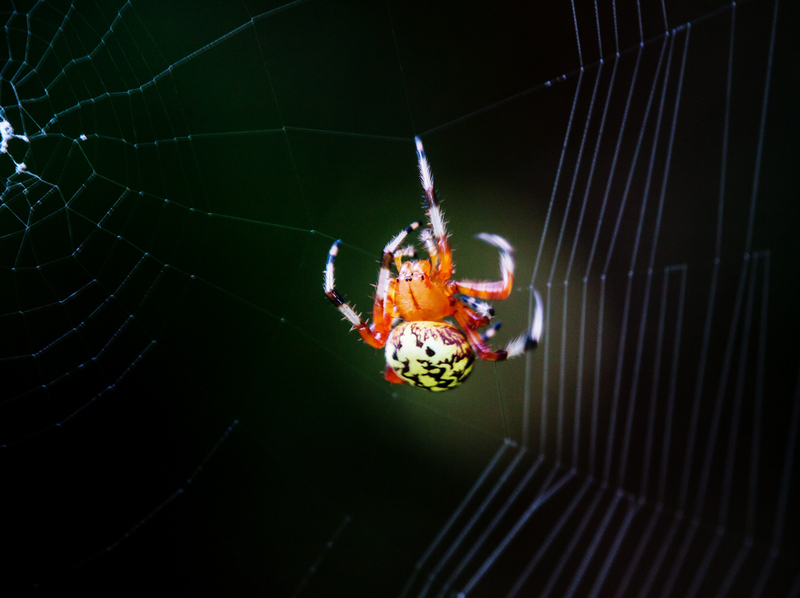 There are some subjects, like cute birds, that I photograph that I know will have a broad appeal, but past experience has shown me that spiders tend to divide people into two camps—some people are fascinate and think spiders are totally cool, while others are thoroughly creeped out and find spiders to be repulsive. What do you think about spiders? The calendar says that it is not quite spring, but after the cold weather we have had recently, it sure feels like spring when the temperature reaches 60 degrees F (15.5 degrees C) on consecutive days. As I walked about in my marshland park this past Monday I noticed some small flying insects, giving me hope that dragonflies and damselflies will be on the scene soon. As I was climbing down the stairs of the observation deck, I noticed something hanging in the air. When I bent toward it, it seemed to move farther away from me and eventually came to rest on the surface of the boardwalk. I was a little shocked to see that it was a tiny spider. 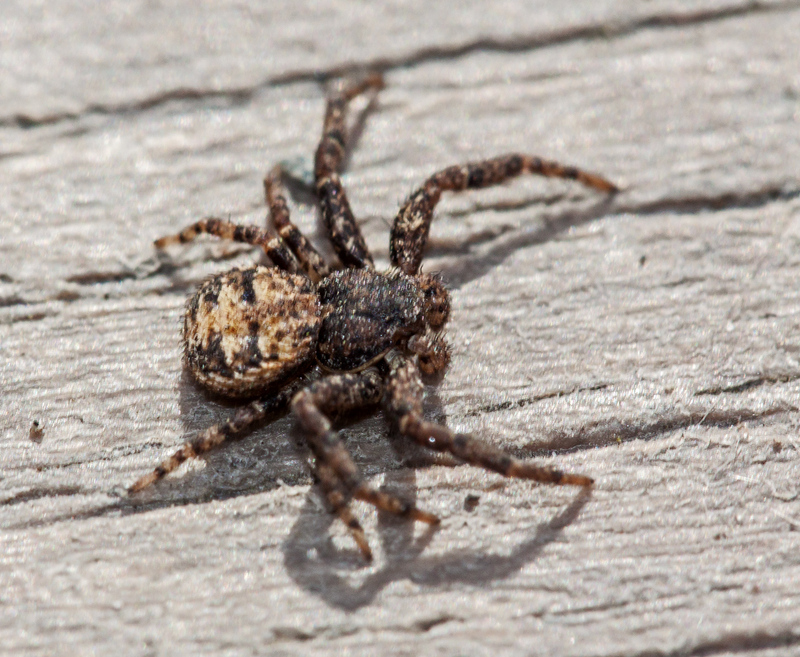 There was no way that I was going to be able to get a shot of the spider with the 150-600mm zoom lens that was on my camera, but fortunately I had my 100mm macro lens in my bag. With one eye on the spider, I rapidly changed lens. As I tried to figure out a way to get a shot, the spider started moving, which, of course, increases the challenge of getting a macro shot. 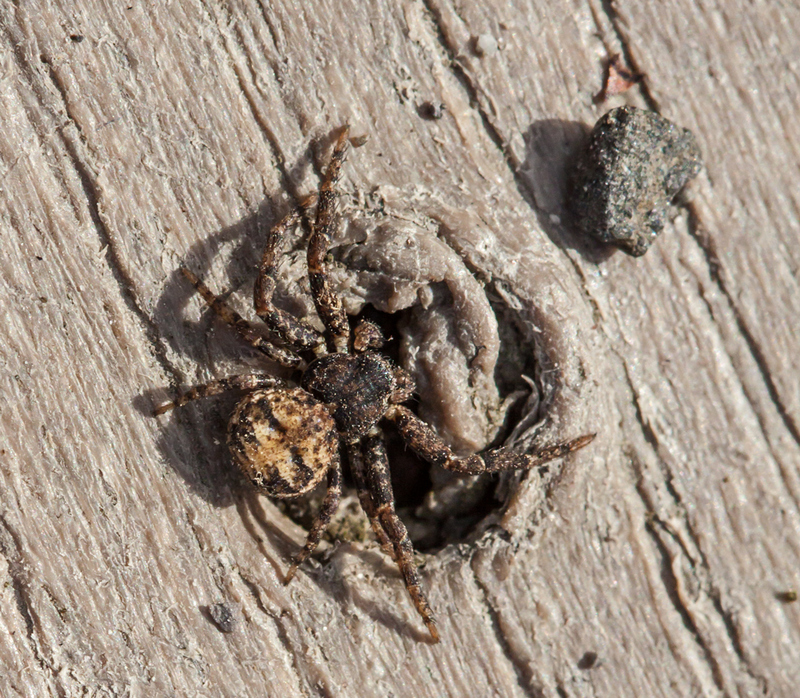 I managed to get a few shots of this early-appearing spider, which I have not yet been able to identify, before it crawled into a crack in the boards and disappeared from view. I’m pretty confident that I will get some better images of spiders as the weather continues to warm up, but this one is special, because it is the first one of the season for me, so I am more than happy with my record shots of it. 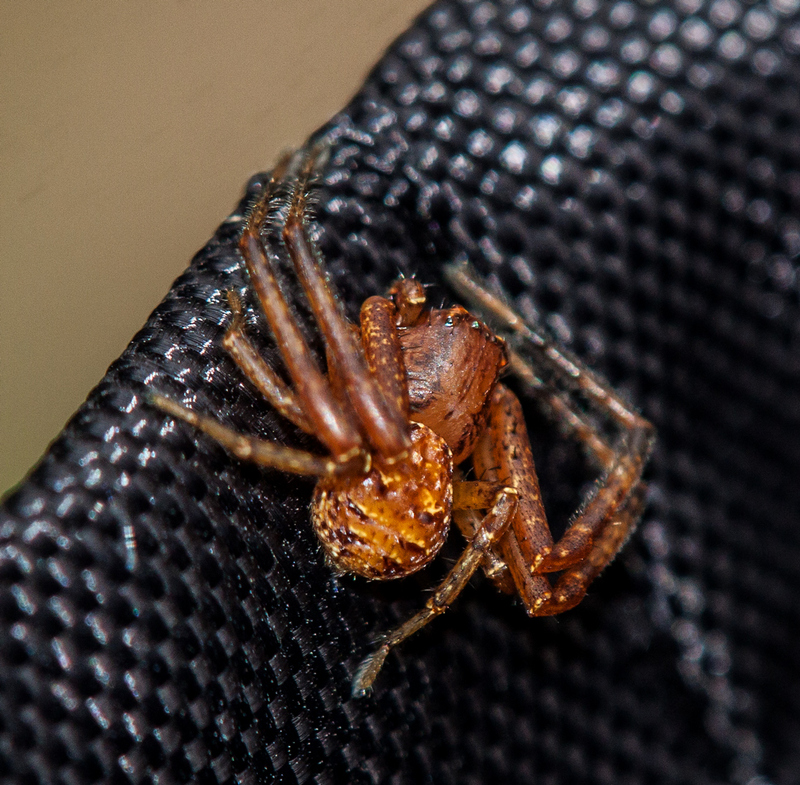 After I have set my camera bag down to take some wildlife shots, I’ve learned from experience that I need to check it carefully for “hitchhikers,” like this little spider that climbed aboard last week while I was focusing on dragonflies.